Figure 1. Map of the study site. Navassa Island is an uninhabited island roughly 5 km2 in size that lies approximately 50 km west of the southwestern coast of Haiti. This publication was prepared by an agency of the United States Government. Although these data have been processed successfully on a computer system at the U.S. Geological Survey, no warranty expressed or implied is made regarding the display or utility of the data on any other system, nor shall the act of distribution imply any such warranty. The U.S. Geological Survey shall not be held liable for improper or incorrect use of the data described and (or) contained herein. Reference herein to any specific commercial product, process, or service by trade name, trademark, manufacturer, or otherwise does not constitute or imply its endorsement, recommendation, or favoring by the United States Government or any agency thereof. 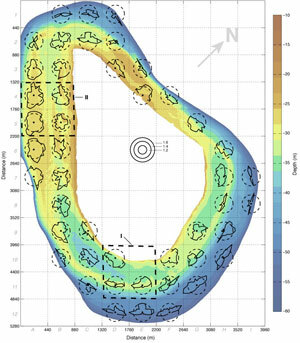 This release provides the numerical results of the fractal analyses discussed in Zawada and others (2010) for the Navassa Island reefscape. The project represents the continuation of a U.S. Geological Survey (USGS) research effort begun in 2006 (Zawada and others, 2006) to understand the patterns and scalability of roughness and topographic complexity from individual corals to complete reefscapes. Navassa Island is located approximately 50 km west of the southwestern tip of Haiti (fig. 1) and is an uninhabited, pear-shaped island 4.64 km2 in area (Miller and others, 2008a). In 1857, Navassa became the third permanent overseas possession of the United States when it was claimed under the Guano Islands Act (Skaggs, 1994) for its substantial phosphate deposits. In 1999, Navassa Island and a 12-mile radius of marine territory were designated as a National Wildlife Refuge under the jurisdiction of the U.S. Fish and Wildlife Service (Miller and others, 2008b). 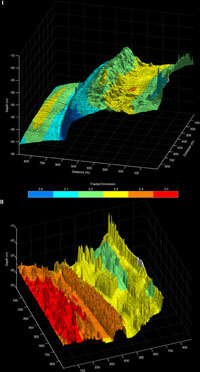 In 2006, the National Oceanic and Atmospheric Administration (NOAA) Center for Coastal Fisheries and Habitat Research conducted the first high-resolution, multibeam bathymetric survey around Navassa Island (Piniak and others, 2006). A 1-meter spatial resolution digital elevation model (DEM) produced by NOAA served as the dataset for the fractal analysis. The study area extended approximately from 18° 25' 17.70" N, 75° 02' 20.50" W to 18° 22' 55.49" N, 74° 59' 34.32" W. The DEM was rotated 32° clockwise to align it with the computational grid used for the fractal analysis (fig. 2). Fractal computations were performed by the USGS both along transects and over the surface of the DEM using the Variation Method of Dubuc and others (1989a,b). Algorithm implementation details are presented in Zawada and Brock (2009) and Zawada and others (2010). Transect analyses involved dividing the DEM into a set of non-overlapping tiles that were 440 x 440 m in size, which created a matrix with 12 rows and 9 columns (fig. 2). For each tile, a series of transects was extracted in a radial pattern emanating from the center in 15° increments. Results from the Variation Method and the corresponding fractal dimensions for each transect are available in the netCDF file 1D_variation_results.nc. See the associated metadata for a description of the file contents. NOTE: In some instances, average elevation variations and fractal dimensions are denoted 'NaN,' which correspond to points with no bathymetric data. Surface roughness (DS) was estimated for two 881-m x 881-m regions of the seascape (fig. 2, regions I and II) representing extremes in coral cover. Fractal dimensions were computed by moving a 440-m x 440-m window in 1-m increments across each row and down each column of these two regions (fig. 3). Results from the Variation Method and the corresponding fractal dimensions for the surfaces in regions I and II are available in the netCDF files 2D_variation_results_EastCoast.nc (642.5 MB) and 2D_variation_results_SouthCoast.nc (642.5 MB). See the associated east coast metadata and south coast metadata for a description of file contents. Dubuc, B., Quiniou, J.F., Roques-Carmes, C., Tricot, C., and Zucker, S.W., 1989a, Evaluating the fractal dimension of profiles: Physical Review A, v. 39, no. 3, p. 1500-1512. Dubuc, B., Zucker, S.W., Tricot, C., Quiniou, J.F., and Wehbi, D., 1989b, Evaluating the fractal dimension of surfaces: Proceedings of the Royal Society of London Series AMathematical Physical and Engineering Sciences, v. 425, no. 1868, p. 113-127. Miller, M.W., Gleason, A., McClellan, D., Piniak, G., Williams, D., Wiener, J.W., Gude, A., and Schwagerl, J., 2008a, The state of coral reef ecosystems of Navassa Island, in Waddell, J.E., and Clarke, A.M., eds., The state of coral reef ecosystems of the United States and Pacific Freely Associated States: Silver Spring, MD, NOAA/NCCOS Center for Coastal Monitoring and Assessment's Biogeography Team, 569 p.
Miller, M.W., Halley, R.B., and Gleason, A.C.R., 2008b, Reef geology and biology of Navassa Island, in Riegl, B.M., and Dodge, R.E., eds., Coral reefs of the USA: Springer, p. 407-433. Piniak, G.A., Addison, C.M., Degan, B.P., Uhrin, A.V., and Viehman, T.S., 2006, Characterization of Navassa National Wildlife RefugeA preliminary report for NF-06-05 (NOAA ship "Nancy Foster", April 18-30, 2006): Beaufort, NC, NOAA Technical Memorandum NOS NCCOS #38, 48 p.
Zawada, D.G., Piniak, G.A., and Hearn, C.J., 2010, Topographic complexity and roughness of a tropical benthic seascape: Geophysical Research Letters, v. 37, 6 p., accessed October 14, 2010, at http://www.agu.org/journals/gl/gl1014/2010GL043789/. Zawada, D.G., Rohwer, F.L., and Frank, L.R., 2006, Scalability of coral rugosity from microns to centimeters [abs. ]: Eos, Transactions, American Geophysical Union, fall meeting, abstract no. OS33F-05, v. 87, no. 52. Funding for this project was provided by the U.S. Geological Survey - Coastal and Marine Geology Program. Bathymetry data were provided by the National Oceanic and Atmospheric Administration Center for Coastal Fisheries and Habitat Research. Zawada, D.G., 2011, Fractal analysis of the Navassa Island seascape: U.S. Geological Survey Data Series 592, available online only at https://pubs.usgs.gov/ds/592/.